It was a lovely day of sun and cloud and threatening rain which never materialised. After shopping and a long overdue almond croissant, we decided to visit Old Thatch, an NGS garden which was open today. Linda (eventually) took us there, down quaint country lanes and over the Basingstoke Canal, and, eventually to Dogmersfield. Old Thatch is hidden away in woodland, the land (about 10 acres) sloping down to the edge of the canal which, built in 1792, is not as old as the house. 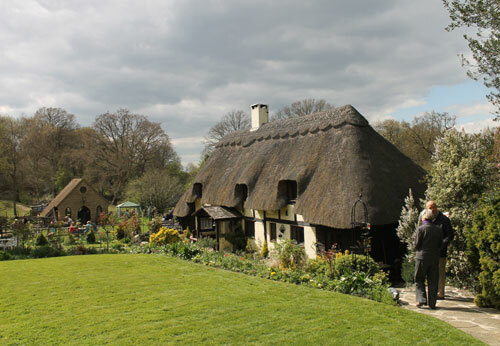 Mind you, the thatched house as we see it today is a good deal bigger than the original which was built sometime in the 17th century. According to the hand-out we picked up at the gate, the original house would have been a “…simple A-frame hovel without a chimney.” Sounds pretty ghastly! Today, of course, it looks perfect for decorating the lid of a tin of biscuits or the final image of a 900 piece jigsaw. Quintessentially English, in fact. I’d just like to mention the hand-out and map we received at the gate. A fantastic idea and very welcomed (by us at least). Apart from the obvious advantages of the map, the short historical notes are an excellent way to dissect the place and put it into context. It’s not so bad with small gardens but when you visit a big one like this, it’s always great to know a bit of the history of where you’re walking. 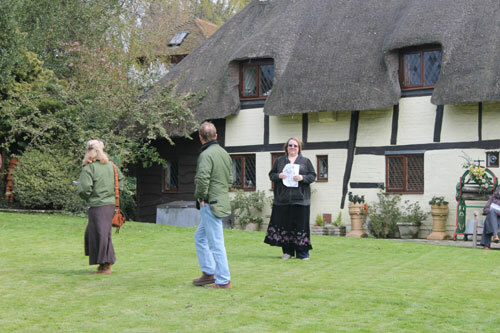 The house sits, more or less, in the centre and the grounds spread out around it. Not that the thatch is the only building these days. There’s the Chapel (serving teas and cake), the Millennium Barn (built in 2000 and housing, among other things, a dovecot) and another big building without a name to indicate its purpose (it might be where the owner’s actually live). There’s even a granary sitting atop the rat defying mushrooms so popular in gardens these days (Mirinda wants one which, in itself, makes them popular). The Chapel was built on the site of a goat house. A blind owner had a rope fence leading to the goats so she could find her way down there to feed them each day. After the Chapel was built (sometime after 1986), the present owners were married in it without, as they state in the hand-out, any goats. In fact, we didn’t see any goats so I assume they don’t live there any longer. Goats there may not be but they do have some sheep and three very tiny donkeys. 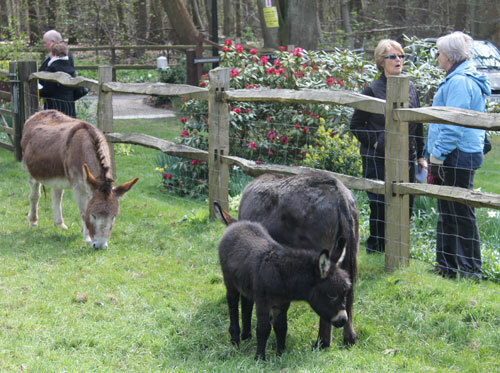 The smallest donkey is not long born and garnered many an ‘ooh’ and ‘ahh’ from the constant stream of visitors who patted him through the wire fence. There’s a lot of tiny areas dedicated to various plantings but the thing about this garden is the whole which is far greater than the sum of its parts, though the staggering amount of daffodils is almost incomprehensible. The current owner planted 50,000 bulbs every year for ten years. Makes our little offering a bit sad. Mind you, if I planted 50,000 daffodil bulbs in our little garden, there’d be nothing else. Something we’ve never seen before was the use of sheep’s wool as mulch. It is spread among the plants in the vegetable garden. I thought it was to keep the young plants warm but apparently it’s mulch. It looks a bit odd but if it works, why not? 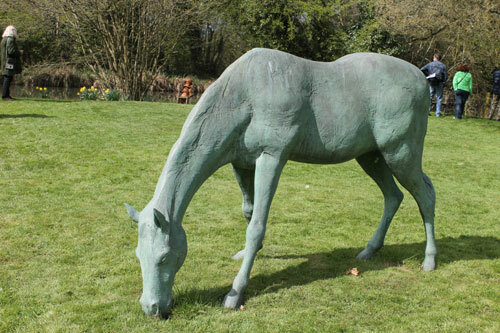 In the garden behind the thatch and spreading down to the canal, is a bronze, full size statue of a horse. It looks remarkably real (except it’s green) and I kept expecting it to stop it’s eating and look up as people wandered by. According to the map they gave us, the horse’s name is Vegetia (or something like that – the copy of the map is a bit blurry). The only information I’ve been able to find is for a Roman pottery woman who is a member of the equestrian class and I have no idea if it relates to her or not. Still…great statue. Of course we indulged our taste-buds with tea and cake before gradually making our way back home. Old Thatch is a very different garden to the ones we normally see but the feel of the place is very friendly and not in the least bit formal. We thoroughly enjoyed it. Another great NGS garden. There’s a few more photos here. This entry was posted in Gardens, Gary's Posts and tagged canal, donkey, garden, NGS, sheep, thatch. Bookmark the permalink. What a lovely place and the horse does look real.